Home BUSINESS OPPORTUNITIES It's a NEW DAWN as Thika heralds the birth of a 'new baby'. It's a NEW DAWN as Thika heralds the birth of a 'new baby'. 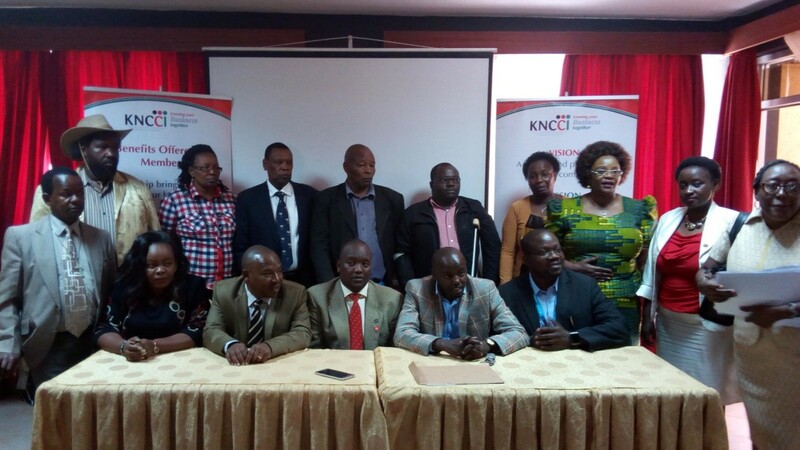 Members of the Kenya National Chamber of Commerce and Industry (KNCCI) Kiambu Chapter during the launch of the Thika Sub-County Branch on Wednesday franked by their chairman Richard Ndung'u (in red tie) and his Thika Sub-Branch counterpart Bernard Karanja (on his right) at a Thika hotel. A new dawn beckoned for Thika residents and business community with the official launch of the Kenya National Chamber of Commerce and Industry (KNCCI) Thika Sub-County Branch at a colourful ceremony on Wednesday. With the unveiling of its new office bearers at a Thika hotel, the Kiambu Branch Chairman Richard Ndung’u took the podium to highlight some of the benefits that the residents of the region were set to reap the benefits from this organisation. Ndung’u said that the chamber would, among others, work hand in hand with the county government in streamlining revenue collection and taxation and tendering processes, be key in its budget making process as well as facilitating in identification of opportunities and markets, both locally and internationally, for the residents of Kiambu County. He added that they would engage the both county national leadership with proposal that will ensure the residents of Kiambu County access quality services in all spheres of life. “This is a new dawn for both Thika Sub-County and Kiambu County in general. As a chamber, we will engage the leadership to ensure that whatever decisions they arrive at mirror the will of the common mwanachi. We will ensure that the public participate in all aspects of governance and lobby for business and mwanachi friendly policies that will pave way for the economic growth of this county and its residents,” said Ndung’u. The Kiambu boss reminded the participants that they will use the chamber as a vehicle to lobby for local and international funding for development projects that will be beneficial to the county, with special focus on youth and SMEs’ empowerment. Thika Branch Chairman Bernard Karanja Ndung’u reckoned that Thika, being both a commercial and industrial hub, had all the potential to grow only if the people worked together and lay down the appropriate economic strategies. He added that as a main contributor to the county’s revenue kitty, its people needed team up and fully participate in the development of their own sub-county. “Investors have already identified Thika as a real hub of business and commerce something that its residents must fully advantage of. We contribute the lion share to the county government’s revenue kitty. Thus, our voice in the county needs to be heard. For this to happen, we have to be united, work as a team and fully participate in the county government’s policy formulation,” said Karanja. He said that his first task as the sub-county head was to bring together all the different business sectors, especially the SMEs and the informal sector, with the view of coming up with a common agenda for the business community in Thika. “SMEs and the informal sector are key to the chamber’s focus. My first assignment will be to establish the logistics for opening an office within the next three weeks. Thereafter, I will meet all traders from all sectors so that we can come up with a common agenda that will enhance business for all,” he said. Karanja said that, as a chamber, they planned to encourage its members and the business community in general, to employ ‘Blue Ocean business Strategy’ where instead of traders engaging in head-to-head competition in search of sustained profitable growth, they would assist them create a leap in value for their businesses and potential clients by unlocking new market demand. “As a long-term measure and with the help of the county government and landlords, we plan to apply the idea of business segmentation where we will divide the town into different homogeneous groups of consumers where traders in each of these segments can serve a particular products or services that match to unique customers’ needs. For instance, we can have a street where customers identify with clothing, electronics, banking services and so on,” explained Karanja.